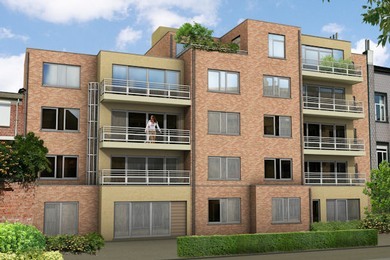 The size of the apartments varies between 50m³ and 140m³. one to three bedrooms a bathroom with cabinets and bathroom fittings. Large windows provided the apartment with light. They offer a great view of the terrace and enclosed garden. In the cellar there is a room for an individual storage area, a parking space or closed off parking space. Every building has a lift from the garage. The finish of the interior can be adjust to your preferences. Your apartment becomes a unique place. Contemporary and well-thought out architecture. That also contributes to your happiness. We offer a high standard of finish and flexibility in the choice of materials for the interior,.This project has an added advantage in relation to the demand for ‘tailor-made’ homes. These apartments satisfy the most creative interior projects. They can also be rapidly adapted to changes in the status of their residents: an undeniable plus point. Happiness: You can’t deny it. The price largely exceeds expectations. 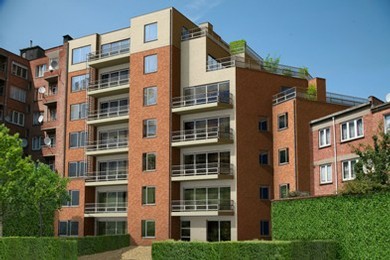 The ‘Vue sur Bonheur’ apartments offer you the comfort of being low-energy: a godsend for your budget. Particular attention was spent to safety and privacy, a basic need. All the apartments heve a burglar-proof front door, with security cylinder and video-phone which can be used to open the front door to the building. The underground car park is only available to residents of the apartments and is closed by means of an automatic door. The building satisfies all statutory and loyal requirements in relation to fire safety (compartmentalisation, fire escapes etc. ).